I am two photoshoots behind! I have a dress and a skirt that I have completed and am very excited to show you — but the weekend had been crazy busy and I only like to do photos in natural light these days. On Saturday night I did manage to squeeze in a few hours of sewing. 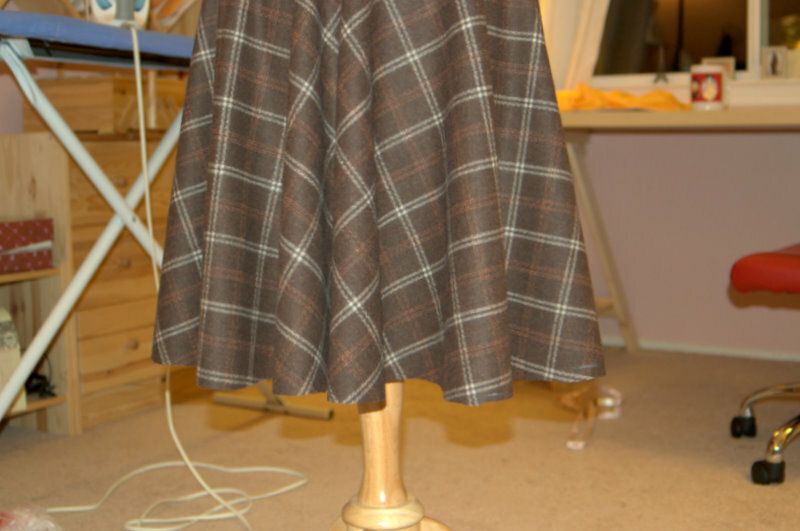 I am currently making my second winter skirt, a Cupcake-Goddess-inspired circle skirt. It is not completed yet — I didnt have lining on hand and I was too busy after work to go to the fabric stores, so the completed shell of the skirt was hanging on the dressform for an entire week! But it turned out to be a good thing, because the bias part of the skirt got longer, by a lot! I needed to cut the skirt bottom so that the hem is even. Tada! Basically, I tied a string to a ruler (I made the mistake of using plastic ruler, which bends, the better option would be a wooden/steel ruler, or any flat solid objects that you can tie to), tied the other end of the string to an arm of the scissor. I made some adjustments to the length of the ribbon to make sure it will produce a hem at a desirable height. Then, i put the ruler directly below the hem, stepped my feet on it so that it doesnt move up. 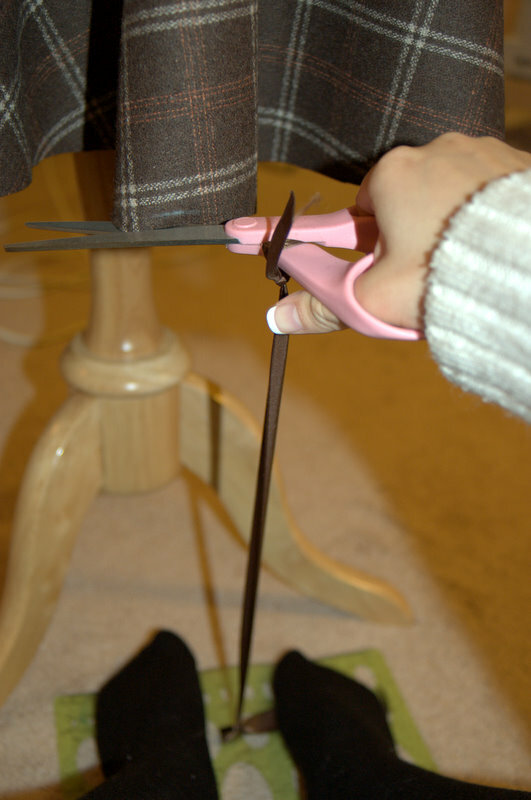 With the string taught and scissor always parallel to the ground, i start cutting off excess hem, and turning my dressform around slowly so that I /ruler does not have to move. (You can substitute the dressform with a real person so that it rotates automatically 😛 ). Sorry for the crappy photos, this happened at night and I had to use flash. I hope my description was clear, let me know if you have any questions, or any other methods you use to get a straight hem!!! This entry was posted on Sunday, November 14th, 2010 at 9:09 pm	and posted in sewing, tips. You can follow any responses to this entry through the RSS 2.0 feed. I love your creativity! LOL. I would never have thought to use the string and “rule” to hem a skirt like that. It looks really good! Maybe they could deliver faster for you? LOL – I thought the same thing when I bought one from eBay recently and opened up the parcel. But as the seller had kindly dismantled it (for easier packaging/wrapping in the post) I realised that the short-ish piece of wood with all the markings in inches could easily be swapped out by me for a new piece of wood (bought from the hardware store or DIY shop) as the wood just screws into place. I can then add my own custom markings for my preferred different skirt lengths (pencil, circle, midi, maxi) – I could even use the left to show lengths for when I want to make a skirt wearing flat shoes, and make markings on the right-hand side/edge for heels! not sure why I didnt reply to this! did you end up swapping the wood? I actually already has a long piece of ruler (wooden) that looks like it could be swapped in! hmmmmm, tempting! This is brilliant! Very ingenious and such a great idea! I love this fabric too! Oh, its going to look just lovely! I can’t wait to see the finished result.